Mrs Jean Jarden, nee Jean Johnston, was born in 1907. She married Benjamin (“Ben”) Jarden in 1932. In the late 1970s Jean Jarden was generally regarded as the best women’s croquet player in the world. She was also regarded as one the three best Kiwis among the NZ Women and was very competitive in open events. The following are memories of Jean from John Prince. 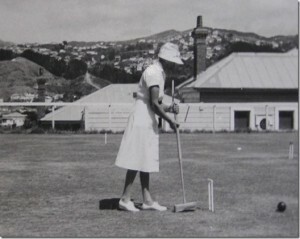 Jean played with a very upright side style holding the mallet with both hands at the top. She was a very reliable shot, hardly ever missing at 10-12 yards. During her match in the 1963 MacRobertson against England at Hamilton, her opponent Pat Cotter unwisely dribbled at Jean’s tice, missed and finished on the boundary level with hoop two. Jean promptly hit the tice dead centre effectively rushing it to Cotter’s ball and established a break to 4 back. When stalking a long shot, she would pick out a spot about 2 yards ahead of her ball and focus on that spot throughout the shot. When I first saw her playing in the early 60’s, like nearly every player she would take the longer defensive lift shots usually from “B” baulk at partner centre court. Around the 70’s players started to take on the short lift from time to time and Jean became very consistent, so much so that I’d often lay up quite wide apart when I played her.